For the last couple of years, I’ve done year-end or new year roundups, looking at popular posts and various stats about my writing. But as I started drafting a similar post for this year, I decided not to do it. If you check out my recent 2018 writing portfolio, you’ll see that I’ve written hundreds of thousands of words on diverse topics, mostly related to marketing or business. So, there’s no need to cover that ground again. Instead, I’m going to look forward, and share some of my plans for 2019. Here’s my action list. Publishing Exploring Shadeism, based on a Masters research project, is one of my best personal achievements in 2018. But because of other stuff going on, I wasn’t able to give full attention to launching it properly. I (and a great team of interested friends) did a lot of the groundwork for this last year, so I intend to launch it in the first quarter of 2019. Under nice to have, I’d also like to run a new survey on current attitudes to shadeism, so I can update the book later in the year. In December 2017, I got the best advice from my sister about the writer mentoring program I’d been thinking of launching. She said: “Don’t wait for things to be perfect; go ahead and do it.” So I did, and thoroughly enjoyed the experience. According to the feedback, so did the participants. I helped a few writers get clear about their business and at least one started a new blog. In 2019, I’m running it again, starting February 4. If you’re interested, check out the details on the Biz of Writing page. Way back in 2009, I did an ebook, partly to bring together a series of blog posts, partly to test the then new Kindle Direct Publishing service. It was called Getting Started in Blogging. It’s proved popular, not that you’d guess it from the paltry number of reviews. I’ve been meaning to update it for a while, and now that WordPress is at version 5.0, I think it’s finally time. So look out for the second edition of that later in the year. So those are my top three priorities for 2019. I have others, of course, but I’m wary of making the list so long that it becomes an obstacle rather than a welcome reminder. Love it! I was so impressed in our conversation when you told me your 3 goals for 2019. 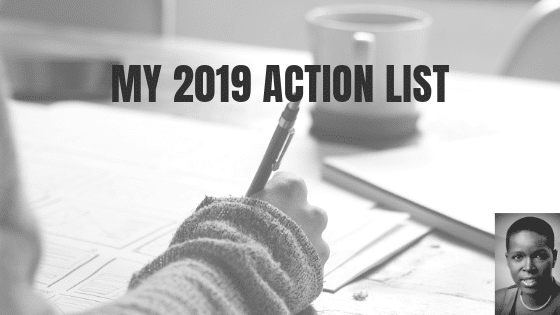 I thought, “wow, if I could narrow down my list to just 3 goals for the entire year, I might actually accomplish them!” This is a really great example of “SMART Goals” – especially in being feasible, or A for “Actually Achievable,” the toughest part of goal setting, IMO.